This will be a 12-4-12 swap. others will be wait listed. that is 6 weeks from today. as I will be using small flat rate boxes to return the swaps. and in some cases tripled since last year. Payment will be made through Paypal only. little bits dangling off the edges are acceptable. NO PAPER is to be used in this swap. Fabric, felt, lace, basically any textiles are acceptable. Images must be printed on fabric. but I ask that you keep colors soft, faded, vintage-like. but it is perfectly fine if they are. and remember to autograph the reverse side. do something with them and share. and I will create a post sharing all of your wonderful ideas. simply leave a comment and I will answer it in the comments' section. feel free to grab my button to help spread the word. Great swap, fabric and nature got to love it. Please sign me up. Thanks for hosting! Yay! Count me in. I have been wanting to work with fabric, this swap will be fun! This is totally out of my comfort zone and very challenging to me. I can not resist...sign me up!! 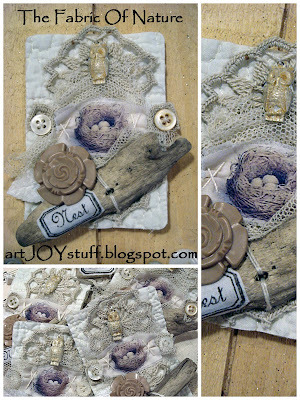 ATC's are not my thing BUT working with fabric is and I love the theme so I cannot pass this up!!!! Oh Kimberly your nature piece tags are so beautiful,- how I wish I had time--but 12 is too much now when summer is close and I have to sew for the shop....also I`m in the middle of my first book and want to finish it before too long! I have to resist dear friend. can we stamp an image on the fabric? Okay ladies, we still have room for 4 more! Amy mentioned not having a blog, that should never stop anyone from joining in, all are welcome! 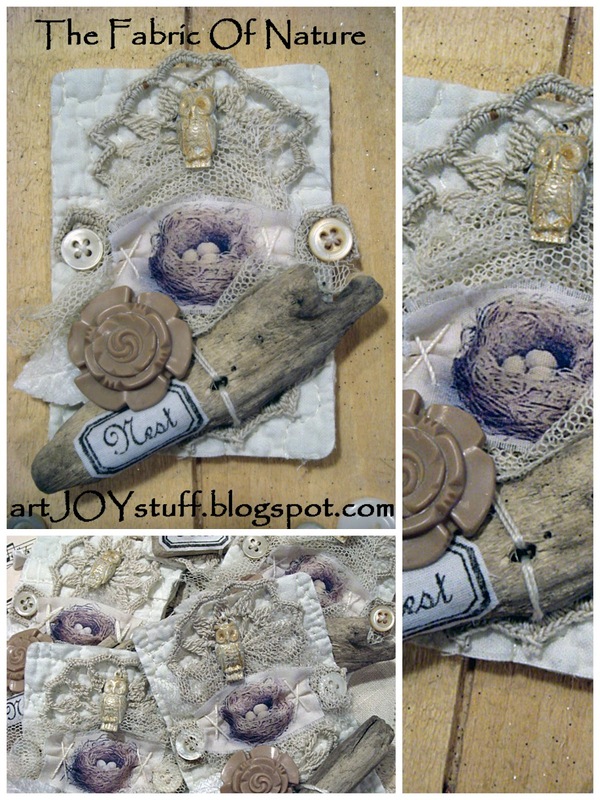 Karla had a great question about stamping on fabric, great idea and totally acceptable for this swap! Hi Kim--Sign me up, please!! I've been itching to do a swap for a while now, and yours it is! P.S. the cards I ordered from you arrived and are SO wonderful...I love them! This will be very interesting for me. Soooo please sign me up! I would love to be included as well please! Still room for one more! This is going to be a wonderful swap for sure! Room for one more and I will be accepting wait list sign-ups. If you would like to sign-up for the wait-list, you are welcome to do so. In the event that someone drops out I will contact anyone on the wait list. Also, if there is enough interest, I will consider putting a second group together. darn, i missed this. will take a spot if someone drops.